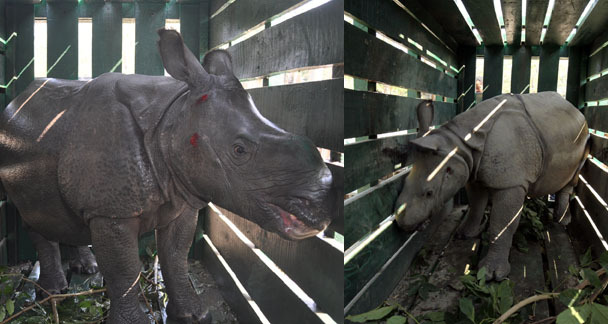 Two of the three one-horned rhino calves adopted by Oil India Limited were translocated to Manas National Park on Sunday, a press communique said. Oil India Ltd had adopted three one-horned rhinos orphaned during the devastating floods in July 2016. On January 21, one of the rhinos and thereafter on February 10, 2019, the two other rhinos were translocated from the Centre for Wildlife Rehabilitation and Conservation (CWRC), Panbari Borguri at Bokakhat in Golaghat district to Manas National Park at Narshingbari. Upon translocation, these one-horned rhinos will be shifted to an acclimatisation site where they will spend the next one year developing site fidelity before being released into the national park. These one-horned rhinos calves were orphaned during the floods in July 2016 and the Oil India Ltd under its CSR initiative took up this noble cause by being the first PSU to fully support hand-raising and rehabilitation of these orphaned rhinos at the Centre for Wildlife Rehabilitation and Conservation (CWRC), Panbari Borguri. They were kept in CWRC, Panbari for almost two-and-half years till the time they had grown a little and were ready to be translocated. Oil India Ltd has committed a total financial assistance of Rs 50 lakh towards this initiative for a period of 4 years starting from the time of adoption till the rhinos are ready to be released in their natural habitat. As per records of CWRC, the names of the rhinos are Dubi (female), Chili (female) and Balu (male). These three names are based on the place of rescue of each rhino, the communique further said.